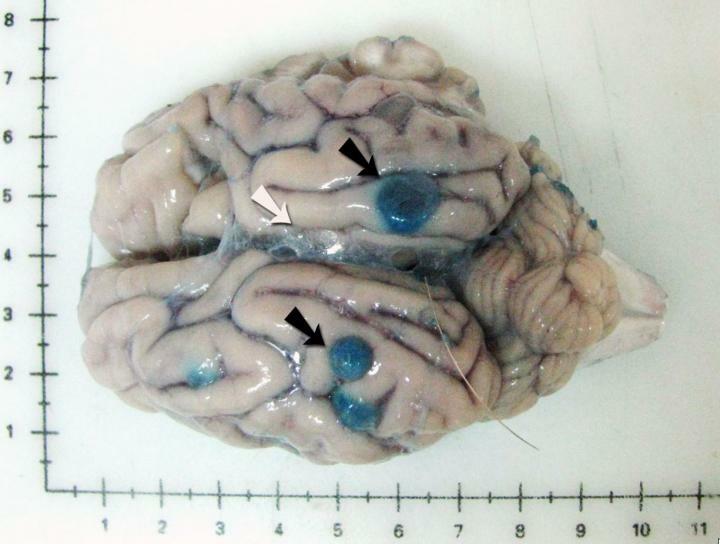 Treating neurocysticercosis (NCC), an infection of the brain with tapeworm larvae, often leads to inflammation and seizures when the parasites in the brain die. Now, researchers have reported in PLOS Neglected Tropical Diseases, using an animal model, that pretreatment with the anti-tumor necrosis factor drug etanercept (ETN) is a viable strategy to manage this post-treatment inflammation. NCC, which is caused by the parasitic cestode Taenia solium, is a major cause of epilepsy in developing countries around the world. While treatments exist to kill the parasite, degenerating cysts in the brain provoke inflammatory responses that can cause a variety of neurological problems. Currently, physicians typically use corticosteroids to control this inflammatory response, but this comes at a high cost of severe side effects with long courses of treatment at high doses. Basic research has suggested that other antiinflammatory drugs including the tumor necrosis factor TNF-α blockers may suppress some pathways involved in the treatment-induced inflammation. In the new work, Siddhartha Mahanty of the National Institute of Allergy and Infectious Diseases, and colleagues from Universidad Peruana Cayetano Heredia in Lima, Peru, used pigs naturally infected with NCC to compare different treatment regiments. One group of pigs received the cysticidal drug praziquantel (PZQ) alone; another received PZG preceded by two doses of the TNF-α blocker ETN; a third received PZG as well as three doses of the steroid dexamathasone (DEX); and the last group was given no treatment. Treatment with ETN before PZQ inhibited the levels of a number of genes known to regulate inflammation. The same degree of changes to gene levels were not seen in the other groups. The degree of inflammation was modestly decreased in both ETN and DEX pretreated animals. In addition, scores of cyst wall damage showed that pretreatment with ETN, unlike DEX, did not inhibit the damage to cysts caused by PZQ. "ETN, a licensed biologic, has been used for TNF-α blockade for over 20 years and has shown remarkable efficacy as an anti-inflammatory agent in rheumatoid arthritis and inflammatory bowel diseases; its safety profile is well known," the researchers say. "Our data demonstrate that TNF-α blockade induces potent suppression of post-treatment pericystic inflammation in a natural infection model of NCC." Funding: This work was supported by Dr. Theodore Nash from the intramural research program of the National Institute of Allergy and Infectious Diseases at the National Institutes of Health. The authors also thank Innóvate Peru (http://www.innovateperu.gob.pe/) for their support through project 124-FINCyT-IB-2013, now closed, awarded to Dr. Cristina Guerra-Giraldez, and the Cysticercosis Working Group in Peru for logistical support in performing the study in Peru. The funders had no role in study design, data collection and analysis, decision to publish, or preparation of the manuscript.